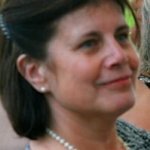 A blog written by retired GP, Dr Lynda Ware, for clinicians. 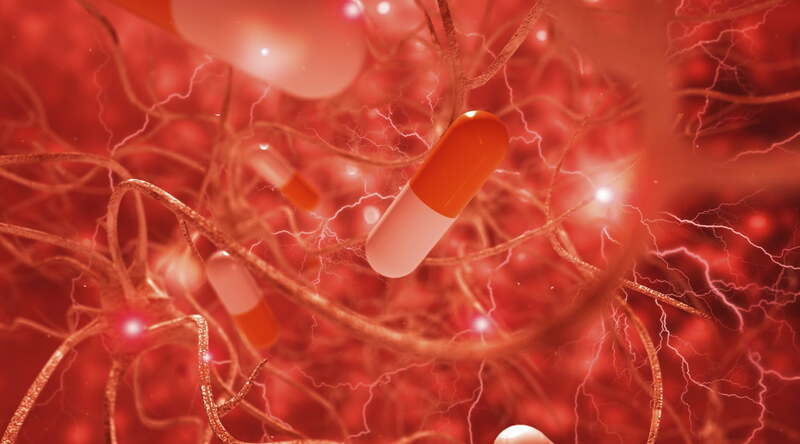 The novel oral anticoagulants – or NOACs – are the new kids on the block in anticoagulation. They appear to be as effective as warfarin but with a better safety profile. A Cochrane review published in June 2015 (1) explores the role of NOACs in the treatment of deep vein thrombosis (DVT). So what is novel about the NOACs? DVTs are conventionally treated with parenteral unfractionated heparin or subcutaneous low molecular weight heparin together with warfarin. Once therapeutic levels of warfarin have been reached, as measured by the International Normalised Ratio (INR), heparin is discontinued. The NOACs comprise direct thrombin inhibitors (DTI) and direct Factor Xa Inhibitors and were specifically designed to overcome the limitations of warfarin (2). They are given orally, have a predictable effect, do not require monitoring and dosing, and have few known drug interactions. We need to visit the dustier recesses of our medical student memories to take a look at the clotting cascade. 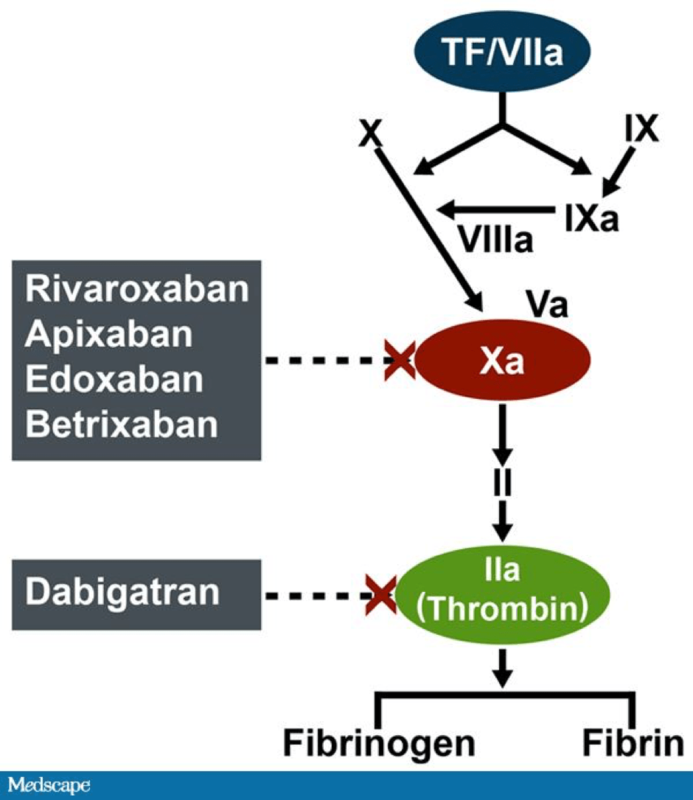 DTIs (eg dabigatran) and Factor Xa inhibitors (eg rivaroxaban) act directly on thrombin and factor Xa respectively, without the need for cofactors such as antithrombin. DVT is not uncommon and affects around 1:1000 people (3). It has associations with various risk factors including immobility, smoking, obesity, surgery, trauma, cancer, thrombophilia, oestrogen in the combined oral contraceptive pill and HRT . Pulmonary embolism occurs in 3-4:10000 people, 70-80% of whom will also have a DVT, although only 15% of these DVTs will be symptomatic. How effective and safe are NOACs compared to conventional treatment of DVT? The Cochrane Review, which set out to answer this question, included 11 RCTs, with 27945 participants. 3 RCTS looked at oral DTIs (dabigatran in 2; ximelagatran in 1) and 8 RCTs tested Factor Xa inhibitors (rivaroxaban in 4; apixaban in 2; edoxaban in 2). The diagnosis of DVT was confirmed in each case by standard imaging techniques. The primary outcomes were recurrent venous thromboembolism (VTE) and fatal/non-fatal pulmonary embolism. Secondary outcomes included all-cause mortality, post-thrombotic syndrome (PTS), adverse effects and health-related quality of life. The studies were found to be of high methodological standard, with high quality evidence and a low risk of bias. A meta-analysis of the three studies (7596 participants) comparing oral DTIs with standard anticoagulation showed no difference in the rate of recurrent VTE, recurrent DVT, fatal and non-fatal PE or all-cause mortality. Oral DTIs were, however, associated with a reduced risk of bleeding. A meta-analysis of the eight studies (16356 participants) comparing oral Factor Xa inhibitors with standard anticoagulation showed no difference in the rate of recurrent VTE, fatal and non-fatal PE and all-cause mortality. There was a weak association, heavily dependent on a single study, with a reduced risk of recurrent DVT but this was only seen in the first three months of treatment. Factor Xa inhibitors also had a lower risk of bleeding. None of the studies measured health-related quality of life or PTS. So what conclusions can we draw from these results? The studies included in the Cochrane Review were large and of high quality. The National Institute for Health and Care Excellence (NICE) has given its stamp of approval to rivaroxaban (2012), dabigatran (2014) and apixaban (2015) as options to be considered in the treatment of VTE in adults. Edoxaban awaits pronouncement in August 2015. NOACs have clear benefits in terms of ease of use and lower risks of major bleeding. Caution must be exercised in people with compromised renal function since the NOACs are all to some extent excreted via the kidneys. At present there is no blood monitoring test available for NOACs as there is for warfarin. This would be of particular use and relevance, for example, in patients with impaired renal function or those requiring surgery or presenting with major bleeding. The search is on for an antidote to the NOACs. One hopeful candidate is idarucizumab for reversing dabigatran (4). It is not yet known what role NOACs have in the treatment of other categories of VTE such as those associated with malignancy and thrombophilia. Further studies are needed to look at head-to-head comparisons of individual NOACs. A further Cochrane Review is underway looking at the effectiveness of NOACs in the treatment of PE. NICE has approved the use of dabigatran, rivaroxaban and apixaban for patients with non-valvular AF to prevent stroke and systemic embolism (5). Treating deep vein thrombosis: novel ways to anti coagulate by Lynda Ware is licensed under a Creative Commons Attribution-NoDerivatives 4.0 International License. Based on a work at http://onlinelibrary.wiley.com/doi/10.1002/14651858.CD010956.pub2/abstract. Permissions beyond the scope of this license may be available at http://onlinelibrary.wiley.com/doi/10.1002/14651858.CD010956.pub2/abstract. Robertson L, Kesteven P, McCaslin JE. Oral direct thrombin inhibitors or oral factor Xa inhibitors for the treatment of deep vein thrombosis. Cochrane Database of Systematic Reviews 2015, Issue 6. Art. No. : CD010956. DOI: 10.1002/14651858.CD010956.pub2. Association of the British Pharmaceutical Industry Stroke in Atrial Fibrillation Initiative. NOACS: innovation in anticoagulation: optimising the prevention of AF-related stroke. London: Association of the British Pharmaceutical Industry; 2014. One problem with this article. The two primary NOACs were approved by the FDA in spite of the fact the clinical trial results were fraudulent. See research findings of Professor Seife:”Are Your Medications Safe?” Neither Xaralto nor Eliquis were proven to be safe or effective. Additionally, more ED visits were reported for both Xaralto and Eliquis than for Warfarin. This disproves the assumption that they are indeed safer. See: the Institute for Safe Medication Practices 2016 report on Oral anticoagulants.